Graco’s Reactor E-10 is a small, ready-to-use system that helps you get in and get smaller jobs done fast without sacrificing performance. 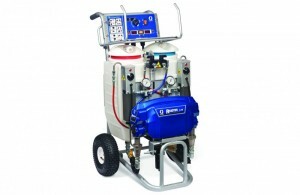 The Reactor E-10 sprayers are ideal for plural-component spray, joint-fill jobs and touch-ups. With smart controls that are easy to setup and simple to operate, the E-10 is a natural complement to any proportioning equipment line-up.